this is my first posting to the blog, so thanks to Mick for inviting me. Current work is revolving around completing the 9F project, which is still taking the major part of my time. The present priority is the completion of the casting masters, where I'm trying to get as many items as possible produced 'ready to run', or at least to a point which makes the construction of some of the parts less of a challenge! 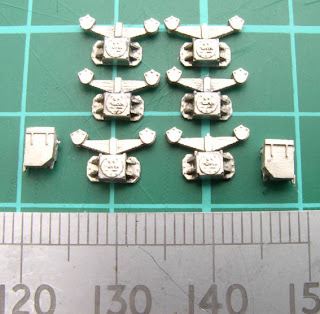 A 2mm scale 9F is enough of a challenge in itself, without adding to the stress levels with too many fiddly parts. We have all chosen 2mm scale because we like it for whatever reason. That doesn't mean we have to be the masochists others sometimes think we must be! You cannot get away from the fact that 2mm is SMALL, so my thoughts were just to try and help the builders as much as possible with the construction of the model. After all, I've had (and am still having) lots of practice! Time will tell, and hopefully not many of the eventual kits will stay in the 'gloat box'! See the photos for some of the parts in question. The photo of some of the loco masters shows the smoke deflectors which will NOT be cast!. 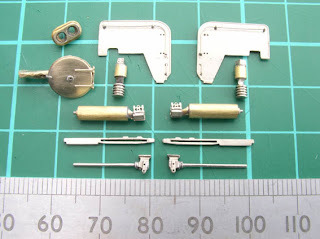 Other items are the double Chimney, Smokebox Door, Air Pumps (for the Tyne Dock locos), Cylinder Valve parts, one part of the handed two part Slidebar assembly, and the crossheads. The tender masters shown are the handed Water Softener boxes, and the Timken axleboxes. My other major project is the proposed layout of Fence Houses mark 2. This finescale version has been in my thoughts ever since I sold the original 32ft long 'N' gauge layout in the early 1980's, and re-joined The 2mm Scale Association after a gap of some 20 years. The new layout exists in only partial reality to date, namely a smaller revised size of 16ft x 9ft, which will be exhibited at our May 12th anniversary 'do' at Burnmoor. The size reduction has been made by simply leaving out some of the intermediate boards. The proposed full size is 37ft x 9ft, and all the baseboards are made, just awaiting the trackwork to start. Just for May, the layout name has been changed to 'Victoria Viaduct', as this has been the main area of focus to date. The rest of the layout on show will be a basic oval of trackwork, and whatever I manage to complete in the time left. The mainline track, as opposed to the fiddle yard, uses the Fence Houses System of etched chairs, with bullhead rail section fitted. The chairs, when soldered to the sleepers give a good representation from normal viewing distance. The fiddle yards are of plain rail strip soldered direct to the sleepers. The difference in rail height (due to the etched chairs lifting the rail prototypically) has been taken care of by packing, or in some instances, by lifting the whole baseboard height. All this can be seen in May, along with other layouts and goodies that Mick has lined up for your delectation. Hope to see you then. [b]Seriously, that she said so, [url=http://stars-vs-stars.com/video-stars-gallery.php]I saw this[/url] with my own eyes. First-time players are eligible to receive a Welcome Bonus that is unlike any other. Get bonuses on the first 20 deposits you make, and get up to $20,000.00 absolutely free. (All funds in US dollars). Some conditions apply regarding the acceptance and use of this bonus.